Partick Thistle manager Alan Archibald was left frustrated by refereeing decisions in the lead up to St Mirren's winning penalty at Firhill. Kenny McLean's free-kick led to a hand ball offence against Abdul Osman in the closing stages as St Mirren won 2-1. "Conrad Balatoni has went for a header, won it and they've given a foul - I've no idea why," said Archibald. "And big Ab has gone to shut down the rebound. He's a yard away and he blasts it off him." Archibald thought it was harsh on Osman to be penalised by referee Willie Collum. 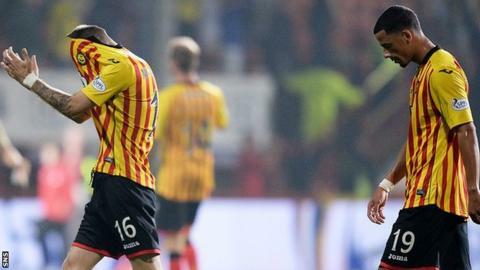 "They say his arms should be down, but it's only natural that the arms go up," the Thistle manager told BBC Scotland. "Some you get, some you don't and I'm more disappointed with the free-kick leading up to it. "That was the pattern of the second half. Silly fouls given that weren't fouls." Archibald insisted that his side had not taken St Mirren lightly despite the visitors arriving without a point in five Scottish Premiership games. "The boys took the warning and in the first half were very, very good," he said. "If we took our chances, it would have been a different game I think, especially the chances after we scored. "I thought, after the first five minutes, we were the better team. "I thought we controlled the midfield and scored a good goal and we had chances after that and didn't take them. "We don't want plaudits for playing well. We want plaudits for playing well and winning the game - we need to combine them both."